We periodically send members of the Loop Telecom's North American TAC support team (DCB personnel) to Taiwan for personal training on updated and new Loop International Products. In addition to enhancing personal relationships with Loop factory engineers and FAEs, this keeps us current on the latest product changes, new products, and future directions. For the Spring 2019 trip, the emphasis is on new packet transport products and TDM to packet transition... making it an evolution instead of a forklift change. In addition to building deeper friendships between the factory and the North American TAC suppot team, current product updates include the AM3440 series, IP6760, IP-6702, PTN 1G and 10G cards, G7860A, iNET PTN and iNMS. Thanks to one of our utility customers for this method to test C37.94 interconnections using our inexpensive BT-1 BERT tester along with a SEL 2894 interface converter. An issue between our customer utility and an interconnecting utility led to a comparative bit error rate test. Our customer is using the BT-1 together with SEL 2894 interface convertors to test and validate error free operation of C37.94 circuits. Read more here. Click here to read the details. A new wiring adapter for the recently relesed AM-3440 mini 4 port T1 card is now shipping. This allows simple RJ-45 wiring for the T1s instead of a bulky fanout cable. DCB develops add-in and accessory products for the Loop International AM-3440 and O-9500 products. These include the award-winning Map34 graphical mapping software, an internal ethernet switch card, a convenient HD-44 to RJ-45 cable replacement connector, an internal 3-port Rs-232 to fiber interface card, and a -48 Volt output 120VAC input power supply. If you use the Loop 3440 or O-9500 Integrated Access Devices, check these out. They save rack space, intallation complexity, and technician time. These inexpensive time-saving products ship from inventory for immediate delivery. Read more here.Click here to read the details. PNE, the Ethernet / Packet Network Emulator Appliance, is our newly developed packet network emulator. It is an easy to use small bench top unit, a powerful simulation device, a tool to aid testing. This app note shows the way it's used to characterize how proposed equipment reacts to network impairment before throwing it into the real world. Click here to read the details. PNE, the Ethernet / Packet Network Emulator Appliance, is our newly developed packet network emulator. It is an easy to use small bench top unit, a powerful simulation device, a tool to aid testing. This tool allows you to simulate a real, imperfect network between equipment under test to determine how well it handles “real world” problems by inserting real-world packet handling imperfections. Click here to read the details. Loop Telecom International released two new controllers for the AM3440 family... the AM3440-CCB and the AM3440-CPA. These greatly enhance performance of the AM3440, already a price/performance leader in the TDM to Packet Switched Network transition marketplace. The new CCB controller features double the memory and four times the processor speed of it's predessor, the CCA controller. Click here to read a quick comparison between the old and the new. 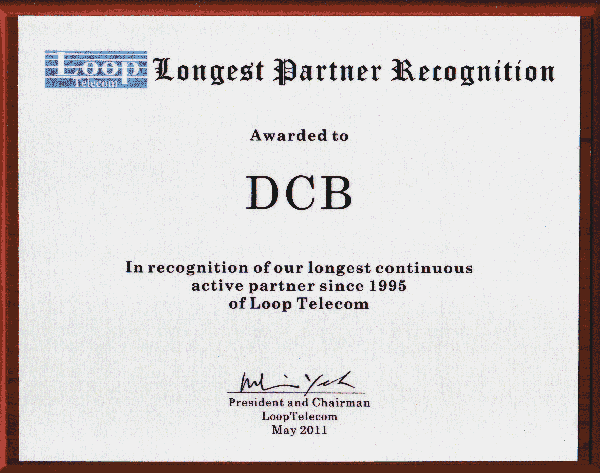 DCB is the Authorized North American Warranty Station and Technical Assistance Center for Loop. As Loop's longest running business partner, our relationship with Loop goes all the way back to 1995. Three new applications notes explaining how to use DCB's new Ethernet Transport Tester (ETTA) were recently released. Two of these detail how to use the ETTA when testing ethernet transport paths for ROIP/VOIP or Telex dispatch systems. The third one explains why using a PC for throughput testing can be quite misleading. Click here to see the ETTA, and download these free white papers. Our friends, customers, and others are in our thoughs as they swim their way through the latest weather. Many DCB products are in use by emergency responders and utilities in storm-damage areas. As we have in the past, DCB is ready to quickly provide replacement equipment for products damaged in the storms. Call us at 800-432-2638 or 217-897-6600 for quickest response. Or click here for a contact form. We respond to the contact form the same day, phones are usually answered in a few seconds. Continuing the DCB tradition of improving products without raising the price, enhanced firmware for the Packet Repeater PR-6606 was released this week. This new firmware allows up to 400 destination addresses selected by up to 20 selection rules with 20 destinations each. When moving to the 6606 hardware platform, we were conservative with the specifications until we had sufficient real-world experience with its actual capabilities. All new orders ship with the new firmware, and existing PR-6606 customers can upgrade by downloading a copy from our web site support section. Click here to read the details. ETTA, the Ethernet Traffic Test Appliance, is our newly developed ethernet traffic bandwidth tester. It is an easy to use hand held, test set that is economical enough to put in the hands of every technician, yet powerful enough to give accurate, reliable ethernet transport test results. Test ethernet links at wire speed, up to 80,000 pps, and verify transport performance with this low-cost tester. It will likely become the standard tester for certifying TDM performance requirements over pseudo-wire ethernet links. Click here to read the details. The new high-performance packet repeater, the PR-6606 has been released for sales. This version of our popular UDP packet repeater handles throughputs of up to 120,000 packets per second and is ideal for larger installations requiring packet replication and fan-out for Netflow, Sflow, streaming protocols, and SCADA UDP packets. Click here to read the details. Customers are asking about these newly discovered CPU exploits and if they affect our products. We’re happy to advise that all products manufactured by Data Comm for Business are secure from the Meltdown and Spectre exploits. They simply don’t apply to our products and no updates are necessary. Click here to download a printed statement. DCB's first PTT-24 installation has been in sevice over a year now improving safety and saving money. The PTT-24 Push-To-Talk Lockout Device monitors 24 incoming T1 lines for remote radio audio channels, protecting against possible loss of critical ground-to-air communications when there is a T1 problem. When a T1 goes out of service, it's channels go busy. Since multiple ground sources coming in from different T1s vie for the same radios, the busied out T1 keys the radios, sometimes blocking all radio transmissions. The PTT-24 monitors incoming T1 lines. If one goes busy it is forced from a busy to a not-busy condition in 20 milliseconds, freeing up the radio system. The PTT-24 went from initial specification to finished product in just one year, quite a feat for such a product. Check out the specs here for your critical distributed radio network installation. The HSW-08 ethernet switch is on sale for $150 each regardless of quantity! This is an 8 port wide temperature range 100BaseT switch with multiple power options in a rugged metal box. Check out the specs here for your critical network installation. Most electric utilities in the USA are using DCB supplied products in some portion of their teleprotection systems. Be it the AM-3440 IAD with our transfer-trip card or mirrored-bit communications, or the O-9400/O-9500 series for SONET through OC-48 and packet communications, DCB Makes It Work for both the largest power utilities and smaller rural co-operatives. Click here for our high speed products, and here for our critical infrastructure security product lineup. Join us at the ASIS-2017! Our products are often used to protect critical infrastructure, government agencies, utilities, industry, and public safety radio systems. Visit with our design, sales, and customer support people while learning about our latest offerings for the security industry at booth 1641. Click here for ASIS-2017 information. Our long-time partner, Phase 4 Design (http://www.phase4.org), received nation-wide commendation recently when one of their projects was highlighted in MissionCritical Communications Magazine. Phase 4 Design is a leading-edge provider of services to the radio communications and telephony markets, offering sales, support, exclusive software products, and ROIP training and design expertise. Their cutting edge state-wide communications system for Washington State Department of Fish and Wildlife provides an economical, reliable ROIP dispatch solution covering regional offices and more than 150 field officers patrolling some of the most rugged, isolated geography in the United States. Phase 4's principal enginer, Dave Grant, designed the network using DCB's UT encrypted tunnels in a network that links 22 Telex control stations with remote repeaters in a way that allows multiple frequency scanning and multiple repeater sites in a challenging environment. Using DCB encrypted tunnels that securely transport all ethernet traffic types, he can later add a SIP-based VOIP telephone system on the same data path allowing tactical phone integration throughout their network, external connections, and even remote satellite connections. Read about the project at their web site here. UT encrypted tunnels enable many wide-area ROIP and VOIP installations around the world. For UT encrypted tunnel information, click here. A few people have asked since DCB products are used in a large number of Critical infrastructure networks. Critical infrastructure agencies and companies are a large part of DCB's customer base and we take their needs seriously. DCB manufactured products do not run Microsoft Windows, and are immune to the WannaCry and similar virus infections. Join us at UTC Telecom 2017. Join us May 8-12 at UTC Telecom 2017 in Charlotte, NC! The UTC Annual Conference is your opportunity to join thousands of information and communications technology (ICT) professionals and technology partners for education-packed days and great-networking nights! Each day is filled with opportunities to learn from global experts who aren’t just talking about modernizing utilities – they’re putting it to work. We'll have a full compliment of experts drawn from our US offices as well as Loop Telecom at booth 808 with the latest equipment to demonstrate and engineers to answer questions. Be sure to join us for the Vendor-Member Band concert/dance at the Awards Banquet. We're proud of the member and vendor musicians that are performing, and everyone is welcome to jump up on stage and play along. Join us at ENTELEC 2017. The Energy Telecommunications and Electrical Associan conference & Expo is in Houston, Tx this year. ENTELEC is a user association focusing on communications and control technologies used by petroleum, natural gas, pipeline and electric utility companies. ENTELEC's primary goal is to provide education for its members. Join us April 25-27, we'll be on the Expo floor at booth 612. As usual, we'll be there with equipment to show and engineers to answer questions. Join us at the UTC Region 5 Conference. Basin Electric Power Cooperative is hosting the 36th annual combined Microwave Interconnected Companies / Microwave Users Group Utilities Telecom Council Region 5 Conference. The conference begins Wednesday morning, April 19, 2017 at the Best Western Ramkota Hotel in Bismarck, ND. As usual, we'll be there with equipment to show and engineers to answer questions. DCB announces a new sales and support partnership with CXR. CXR, a manufacturer of networking and communication equipment headquartered in Europe and DCB have entered in a partnership agreement to promote and support CXR Ethernet networking and extension solutions in the USA and Canada. Click here to read the details. New Applications Note: Redundancy Techniques Using DCB Tunnel Devices and Software. Users have come to rely on DCB tunnel products to implement secure networks for mission critical applications in which downtime must be kept to a minimum. Thus it is not unusual for customers to ask questions about techniques that may be applied to make the tunnel network more robust. This document describes some of those techniques with examples. Click here to download a copy. We have been providing data communications solutions for over 30 years. Here's some of our recent history in the form of announcements. Check the "What's Old in 2015" page to see other news items from 2012 through 2015. Follow this link to research a subject or find background information on a product. Check the "What's Old in 2011" page to see other news items from 2008 through 2011. Follow this link to research a subject or find background information on a product. Check the "What's Old in 2008" page to see other news items from 2005 through 2008. Follow this link to research a subject or find background information on a product. Check the "What's Old in 2004" page to see other news items from 2003 and 2004. Follow this link to research a subject or find background information on a product. Check the "What's Old in 2002" page to see other news items from 2001 and 2002. Follow this link to research a subject or find background information on a product. Check the "What's Old in 2000" page to see other news items from 2000. You may want to follow this link to research a subject or find background information on a product. Check the "What's Old in '99" page to see other news items from 1999. You may want to follow this link to research a subject or find background information on a product. Check the "What's Old in '98" page to see old news items from 1998. You may want to follow this link to research a subject or find background information on a product. Check the "What's Really Old" page to see the news items from 1997 and earlier.